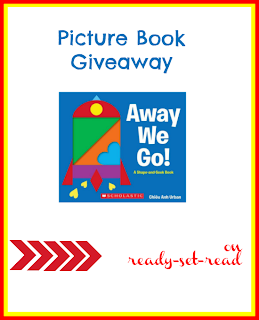 Ready-Set-Read: Shape Preschool Theme Book: Away We Go! Shape Preschool Theme Book: Away We Go! This week I've been working with my three year old to identify shapes during our preschool time. We've done a lot of exploring in our natural world as there are many shapes to find in our environment. We've also checked out some books on a shapes preschool theme. Recently I discovered a new book that features shapes. Away we Go! A Shape and Seek Book by Chieu Anh Urban has become a new favorite book in our home and is perfect for any shape unit. We read this book and did a fun book activity using foam shapes after reading the book. We also found some great activities that the author created to go along with the book and we've been enjoying those as well. I have a giveaway of this book at the bottom of the post so you can enjoy it too! Away we Go! A Shape and Seek Book by Chieu Anh Urban is a fun book for exploring shapes in transportation. Each page begins with a question to the reader, "Do you see a (shape)?" The reader has to seek and find the shape that is named. There are pictures of trucks, trains, buses, rockets, bulldozers, blimps, and more. The pictures are made from bright colored shapes. Each mode of transportation is named at the bottom of the page. Cutaways on each page allow children to trace the shapes and see how shapes can be made from other shapes. The clear pictures, minimal text, and hands on format of the book make this a great pick for preschoolers. Our book activity actually began before we read the book this time. I didn't want my boys to just replicate the pictures in the book. I wanted them to explore their own creativity and see what they would create with shapes. We began with a variety of foam shapes, a bowl of water, and a glass surface (in our case, the french doors in our back). Did you know if you wet foam, it will stick to smooth surfaces like glass? The boys were able to dip their shapes in the water and stick them to the window. After a day or two, the water will dry up, and the shapes will fall down. The boys enjoyed this free play activity for a few days before I introduced the book. One day after school, we sat down to explore Away we Go! The boys loved the book. On each page they tried to find the shape that was named. My kindergartener, Logan, was even able to read the text that labeled each item (such as bus, rocket, etc). After we read the book, the boys picked a shape to replicate and tried to build it. They loved the challenge of building the items. We even ran out of some shapes so they had to use triangles to build squares. They were so proud of their creations and made me promise to leave them up on the windows for as long as possible! Away we Go! is a great book to add to your preschool theme on shapes. Preschoolers often begin by correctly pointing to shapes when an adult labels the shapes. Soon, children will gain the vocabulary to label the shapes themselves. As your child approaches kindergarten, he will learn to identify shapes by features such as number of sides and vertices. The author of Away we Go! 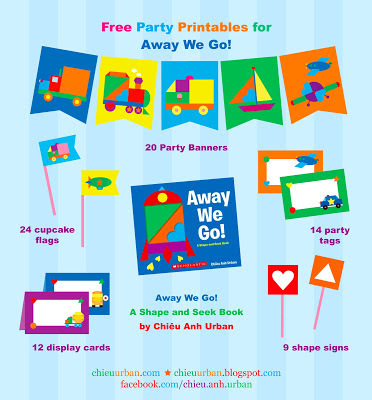 has created a large number of activities and party printables to accompany the book. 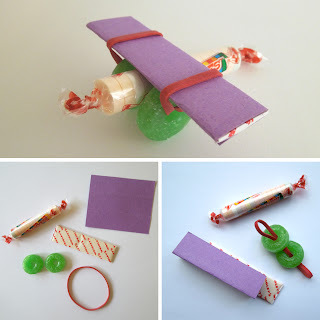 We also explored some of these activities including the candy airplanes. If you would like more books and activities for exploring shapes, check my shapes preschool theme. 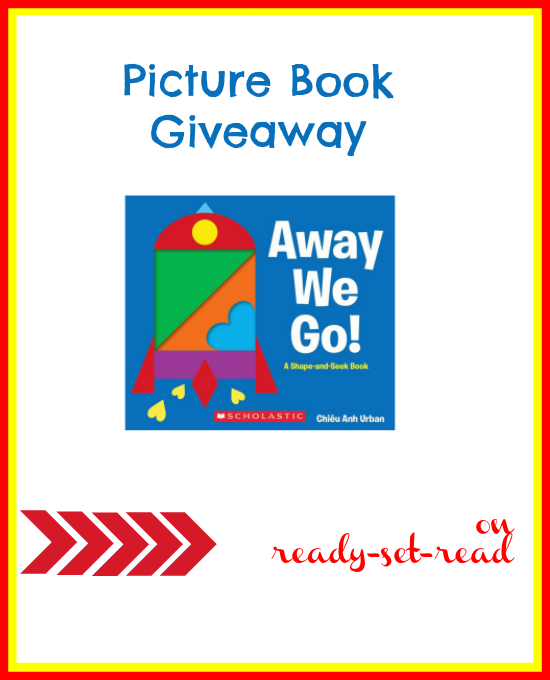 Giveaway: Win a signed copy of Away we Go! Away we Go! is my new fave for studying shapes with kids! I don't usually let a new book surpass the classics that I've been using with kids for years, but this one ranks up right there with the BEST shape books for kids! It is a great find and I hope author Chieu Anh Urban writes more books. I absolutely loved this book and I'm so excited that one of you will receive a free signed copy of the book. Enter on the rafflecopter below. Disclosure: I was sent a free copy of this book in order to review it. No other compensation was provided. This post reflects my honest opinions.